When my cousin sister brought me this popular Hershey's kisses from USA, i could have never thought that i will bake some dangerously addictive stuffed cookies a day. Since i dont get them here in Paris that much easily and its was almost like a treasure for me. Obviously i do take much care and this kisses are sitting in freezer as i dont want to finish with them immediately. I have already baked some classic Peanut butter hershey kisses cookies aka Peanut Blossom cookies with this bite sized pieces of chocolates. My today's cookies are going to be a different one from the usual peanut butter cookies, kids will go crazy if they have their first bite. 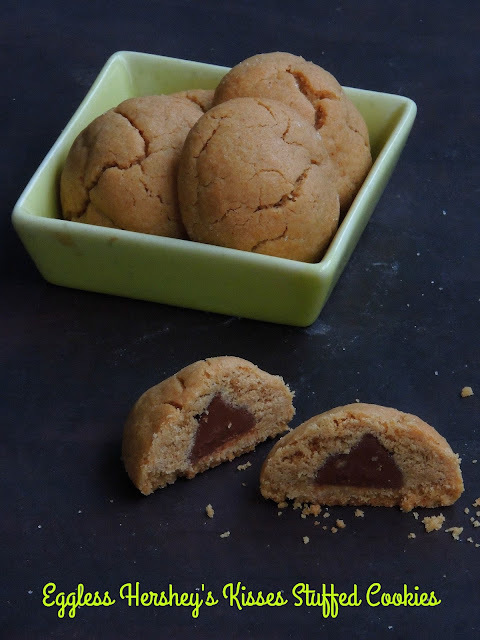 Yes they will be definitely surprised to see the chocolate candy inside this eggless cookies. 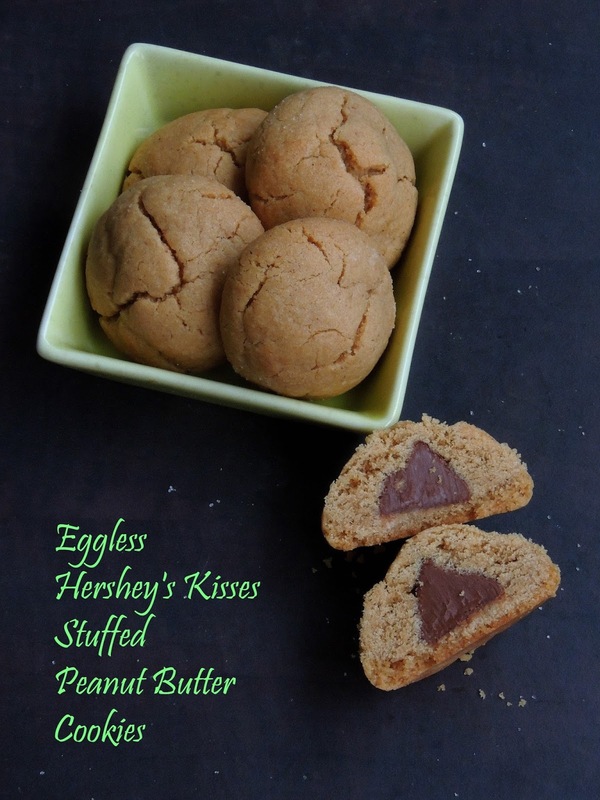 Am running this week's blogging marathon with Holiday dishes as theme, after some eggless double chocolate muffins, my today's post goes for this hershey kisses stuffed cookies. An eggless cookie dough wrapped around a chocolate kiss candy makes this ultimate cookies. And the best part is you will never stop munching this cookies as they are dangerously addictive. 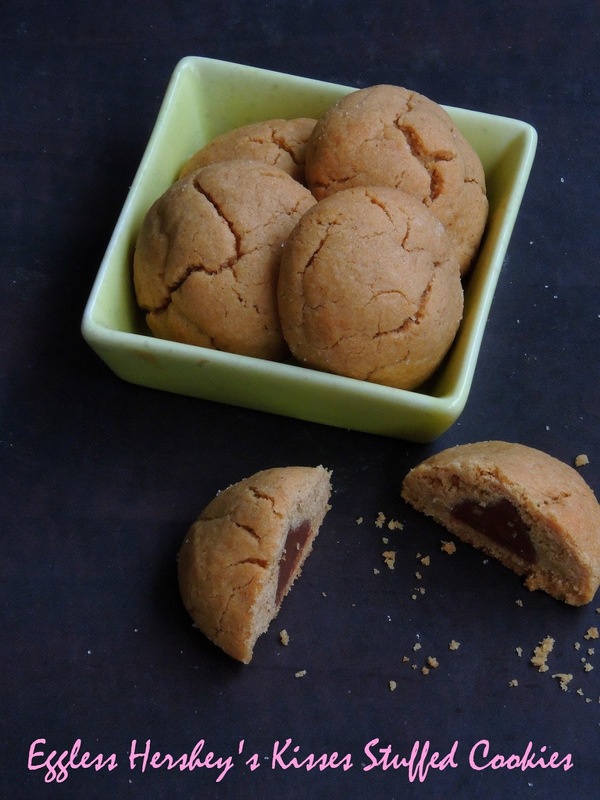 Very easy to prepare, one can bake this cute looking cookies easily with less efforts.Chocolate and peanut butter is one of my favourite combination especially in baking, hence i couldnt stop myself adding peanut butter in the cookies dough. Preheat the oven to 350F, line a baking sheet over a baking tray and keep aside. Beat the sugar, brown sugar, butter and peanut butter in bowl at medium speed until light and fluffy. Add milk, vanilla and salt and beat until well mixed. Add flour and baking soda, beat at low speed, until well mixed. Arrange the dough in fridge for an hour, chilled dough works awesome to shape easily. Divide 10-12 medium sized balls out of the dough, flatten the dough. Place them in lined baking sheet with enough space inbetween. Bake 10-15 minutes or until very lightly golden brown. Let them cool completely and store in air tightened box. Wow what a wonderful surprise inside the cookie!! Perfectly baked!! Wow cookies with hidden Hershey's kisses :) Lovely recipe! Wow ! Hershely kisses hidden in the cookies a great surprise for kids.. Love it. What a cute little surprise in the middle of that cookie. LOVE it. What a lovely surprise...totally love it!